Back in June 2000 the word on Wilshire was that Billy Budd was a show not to be missed, now 14 years later, the word on Wilshire was again that Billy Budd was a show not to be missed. It is the same show, a production of nearly unprecedented critical acclaim that was again at the Dorothy Chandler. By Francesca Zambello the production had originated in Geneva in 1994, the next year it won the Grand Prix des Critiques in Paris, and the next year it took the Olivier Award for Best Opera Production in London. Bass-baritone Rodney Gilfry was the Billy Budd in all these early editions of the production, his iconic role. He was the sole common element except of course for the production itself, its setting of uncanny reference to the worlds of Herman Melville and of Benjamin Britten, not to mention its references to the universal and timeless experience of all humanity — from the crucifix of the mast to the phallic metal pistons that suddenly push up the prow, from the blue platform of life itself to the trapdoors on the deck that open into hidden feelings. This Billy Budd is about everything. As elemental as the pure spirit of Billy Budd is to the world of this opera, it is Captain Vere who is its life force. As captain, he is every man on his ship, but most of all he is Billy Budd and he is his executioner. Captain Vere sacrifices Billy and he sacrifices himself to the forces of man’s nature and men’s laws. The magic of this production takes you inexorably to this delicate and fearsome moment of human passage. 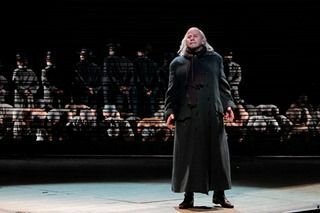 In Los Angeles just now it was tenor Richard Croft, perhaps in his role debut, who brought gravity and authority to Captain Vere, in voice that is pliable and secure, expressive and powerful. Mr. Croft came much more as a mature Mozart tenor than as a Britten tenor, a voice and persona that integrated perfectly into this conception. It was a sincere, moving and masculine performance. Bass-baritone Greer Grimsley was Claggart. Mr. Grimsley reads as a beautiful man and he possesses a beautiful voice, though somehow in this Britten world it is he who destroys beauty. More importantly, it is he who awakens the sexual motions of Britten’s musical psyche and these moments are mesmerizing. This beautiful presence brings a powerful irony to this ugly role that the Zambello production accepts without complication. Baritone Liam Bonner was Billy Budd, and he made the role his own with an uncomplicated wholesomeness, with a simplicity of persona and sound that made his Billy a real boy more than an encompassing image of male innocence. Again, it is the genius of this production that it can transform wholesomeness into a transcendent, even mythic condition. Smaller roles were sensitively cast and generally well performed, particularly the Red Whiskers of Greg Fedderly and the Dansker of James Creswell. The Los Angeles Opera Orchestra is a capable ensemble but it inherently lacks a beauty of tone that could complete and fulfill the acoustical aspiration of this production. Conductor James Conlon well supported the larger outlines of the Britten drama and made it riveting, but he did not achieve the humanity, the softness, the sense of loss and personal tragedy that a deep musical reading will find to grip and possess a listener.